Cipro is a brand name of the generic drug ciprofloxacin and is a prescription antibiotic medication used to treat a variety of bacterial infections. The drug belongs to a group of medications known as fluoroquinolones, or "quinolones" for short. It works by killing certain bacteria that cause infections. Manufactured by Bayer AG, this antibiotic medication is available as a tablet, an oral liquid suspension, ear drops, eye ointment or as an intravenous (IV) solution and is only available on prescription. 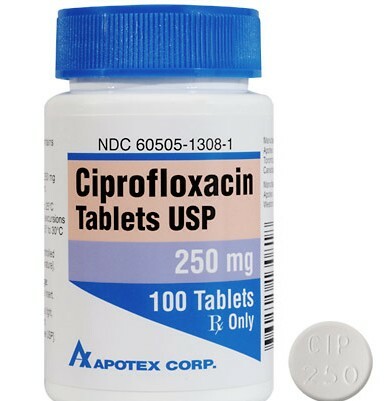 The adult dosage of Ciprofloxacin is usually between 250 mg and 750 mg every 12 hours for oral Cipro and between 200 mg and 400 mg every 8 or 12 hours for intravenous Cipro. Dosage for children depends on the condition being treated, the form the drug is being taken in and the child’s weight. Although Cipro is approved to treat serious urinary tract and kidney infections in children, it is usually not the first choice for treating infections in children as it can cause bone, joint or tendon problems in growing bodies. In cases where diarrhea is caused by bacteria, it can also be treated with ciprofloxacin. Cipro is approved to prevent infections or worsening of infections following exposure to inhaled anthrax. Cipro is normally administered to patients who have been exposed to anthrax to help prevent the patient from contracting any form of infection because of the fact that anthrax weakens the immune system. Although Cipro is classified as a broad spectrum antibiotic, it is not effective in fighting against all types of bacterial infections. However, the drug will not treat infections caused by viruses, such as the common cold or flu. Cipro has been reported to cause tendon damage, especially in patients over 60 or those who have had any organ transplants and who are using any form of corticosteroid medications. If patients experience joint pain, tendon pain or swelling in these areas, they should notify their doctor immediately. Patients should inform their doctor immediately if they experience hallucinations, dizziness, seizures, nightmares, tremors, seizures, depression or paranoia while using Cipro. Patients who engage in strenuous physical activity of any sort should also advise their doctor before using Cipro. Patients may also experience allergic reactions when using Cipro which may include hives, rashes, breathing difficulty or swelling of the lips, throat or mouth. If this happens, medical attention should be sought immediately. Patients who suffer from tendonitis or rheumatoid arthritis should inform their doctor prior to using Cipro. This medication may also affect patients who suffer from seizures or epilepsy, nerve conditions, Myasthenia gravis (muscle weakness), irregular heart rhythm, cerebral arteriosclerosis (hardening of the arteries in the brain), kidney disease, liver conditions or any allergies to food, preservatives or dyes of any sort. Women who are pregnant or who want to fall pregnant should inform their doctor of this before taking Cipro. Mothers who are breastfeeding should also not use Cipro because of the fact that it has been shown to pass through to breast milk and have adverse effects on the baby. Patients who use Cipro may become very sensitive to strong sunlight, so it is advisable for them to wear sunscreen, long-sleeved clothing and hats when outdoors. Before taking Cipro, it is important for the patient to advise their doctor of any herbal or prescription medications that they may already be using. It is important to remember that if the patient experiences any unpleasant side effects while using Cipro, they should contact their doctor as soon as possible.